If suitors were intimidated by Elizabeth Bennet before, imagine her with a sword. Balancing Victorian romance and the zombie apocalypse, “Pride and Prejudice and Zombies” is a fast-paced, surprisingly funny genre clash. Based on Seth Grahame-Smith’s 2009 best-selling novel that pulls directly from Jane Austen’s original text, the film is as much a genteel representation of the Bennet sisters’ search for love as it is an action-packed fight against the undead that roam the countryside, hunting their next victim. The zombies in the film, while just as hard on the eyes, are a lot more complex than the ones prevalent in pop culture today. Zombies in “The Walking Dead,” for example, can only moan, wander around and eat people. These zombies sound like normal people, hold conversations, set traps for unsuspecting passers-by and don’t start to decay until they have their first taste of human brains. In the opening scene, a newly turned zombie hides in plain sight at a party by playing a game of cards. He hasn’t fed yet, so he looks like a normal person — the only indication that he is undead being the bite mark he hides under his sleeve. Despite the intriguing zombies, the film’s strongest aspect undoubtedly is its close connection to Austen’s novel of manners. Director Burr Steers (“17 Again”) remains faithful to “Pride and Prejudice’s” backdrop to lay the foundation for this world. For instance, turning main character Elizabeth Bennet (Lily James) into a sword-slinging zombie slayer is completely reminiscent of the character she was painted to be in “Pride and Prejudice” — a free-spirited, independent young woman who’d rather retain her integrity than marry for anything other than love. 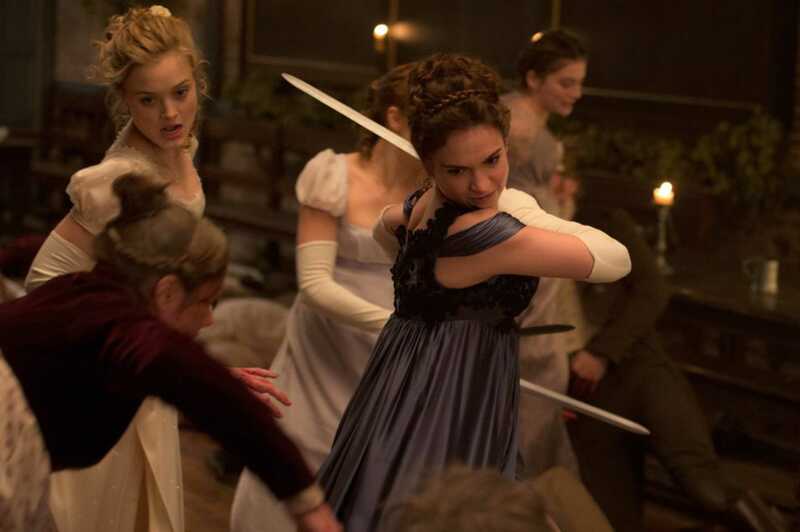 Her place in “Pride and Prejudice and Zombies” imagines her character’s strength physically in addition to her original mental perseverance. Burr even changes her nickname from “Lizzy” to the much less cutesy “Liz” for this reason. It’s what makes her romance with the brooding — and now-skilled zombie hunter — Fitzwilliam Darcy (Sam Riley) so entertaining. Interactions between characters are still filled with Austen’s signature wit and eloquence, only they’re often heightened to meet the movie’s raised stakes as an action-romance flick. A simple walk into town is no longer simple. In this version of Longbourn, characters always yield weapons, not bonnets and ribbons. Many of these tinkered situations — husband-hungry girls in corsets, dancing at a ball, carrying a bunch of concealed weapons — are inadvertently comical already, but shining performances from the principle cast make for genuinely hilarious moments. James and Riley are electric on screen together, staying true to their characters while still taking practically every moment of sexual tension to full-on blows. Matt Smith steals every scene he graces as the farcical Parson Collins. Smith adds a new dimension to “Pride and Prejudice’s” version of Collins, an unlikable busybody who cares little for the feelings of others. Here, he’s melodramatic, superfluous and slightly absurd — but in all the greatest ways. Collins makes even more appearances in this film than in “Pride and Prejudice,” probably because Steers knew just how much the audience would be asking for him. Genetic lottery winners Bella Heathcote and Douglas Booth are appropriately sweet as Jane Bennet, Elizabeth’s sister, and Charles Bingley, Darcy’s best friend and traveling companion. The dynamic between the two in this film is slightly different than Austen’s text, however, as Jane has been trained for combat and could probably run circles around Bingley in a fight. It’s a well-deserved trait for Jane, a character whose emotional strength is often overlooked for Elizabeth’s in the original text. Finally the sisters, much like the previously unrelated zombie and romance genres, are evenly matched.